If you enjoyed looking through the cracks last time for a peek at the hidden entrance at TTC’s Queen Station in Toronto, here’s another place on the TTC to check out. 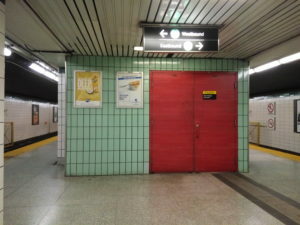 When Bay Station was originally built back in 1966, there were two levels in a configuration much like Bloor-Yonge station, with the lower second platform accessible through stairs and an escalator from the first. This lower platform, also known as Bay Lower, was initially used for a pilot program that had trains turn east onto the Bloor-Danforth line after Museum Station. After only a few months, however, this pilot program failed due to confusion and delays, leading to the closure of the lower platform. Today, although it’s closed to the public, Bay Lower can be rented out for filming, with movies such as Suicide Squad, Max Payne, and many others having have had shots filmed there. If you’d like a small peek at Bay Lower for yourself, next time you’re on the platform of regular Bay Station, look for a set of red doors. 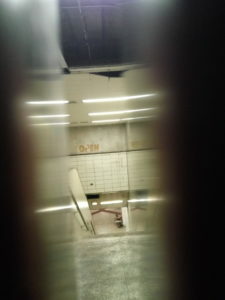 If you look through the cracks, you’ll be able to see the hidden station for yourself.